I watched a TV program last night about Machine Guns...I don't know why this intrigued me so, but alas, I enjoyed learning about the history of the machine gun. 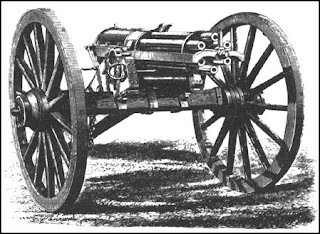 The Gatling gun was invented by Dr. Richard J. Gatling in 1861. It was his intent to save lives on the battlefield. After the American Civil War ended, Gatling discovered many soldiers had died after wounds sustained in battle. His logical told him, if he could invent a weapon that could take the place of 15 men, that would mean less soldiers on the battlefield to be injured or killed. Fuzzy math indeed, however the gun proved to be less than effective during battle because of user error. The gunman would turn the crank to fast and the gun would heat up and jam. The idea was tabled until advances in machine gun technology evolved and became more portable. In the end, the machine gun killed more than 5.5 millions soldiers during WWII, so much for saving lives.